Comment: I built an elaborate 8x12 shed years ago and insulated it incorrectly. I encased the floor joist in plastic. Over the years moisture collected and destroyed the floor joist. The joist set on 3 pressure treated stringers which are in good shape. Above the joist and separated by plastic sheathing, is pressure treated tung and groove plywood. It is not destroyed but it does sag. I would be interested in knowing if it can be salvaged and at what price. I can send pictures. Comment: My single car garage is leaning and needs to be straightened. I'll be getting a new garage door installed after the single-car, detached garage is plumbed. Comment: Considering approx 12x 24 or 14 x 26 shed with concrete slab floor and perhaps finished interior with lights and electricity. Would be in corner of back yard replacing smaller Tuff Shed which does not have concrete floor or finished interior or electricity. Comment: a small beach shack structure, that is used for shade in the summer and small storage in the winter. the front to be open in the summer and closed in the winter. very simple design to be built on a concrete surface next to a six foot wooden fence. any bids would be welcome. 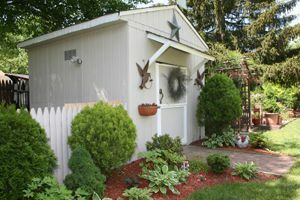 Comment: Looking for a shed large enough to stand upright in (I'm 5' 9") and to house an extension ladder (8' long when folded); also needs to house lawn and garden equipment. Built-in shelves would be nice, but not a must-have. Would prefer it to be vinyl or metal, but not necessarily wood. Portland Shed & Enclosure Builders are rated 4.83 out of 5 based on 536 reviews of 40 pros. Not Looking for Sheds & Enclosures Contractors in Portland, OR?